The first time I ever cried at a movie was during Star Trek II: The Wrath of Khan (1982). Opening day, June 4. Tor Ekeland, Tom Moran, and I skipped school to stand in line at the cinema. Loews Pittsford, the single auditorium out back, which had the best sound and the biggest screen in town. We had no idea what was coming – something like 600 people waited together, on blankets, soda in coolers, Starfleet shirts and Vulcan ears and fanzines everywhere; but no spoilers. McCoy: Jim… I think you’d better get down here. And I’m crying again now. The death of Spock at the end of Star Trek II was the first time somebody close to me had died. (No spoiler; if you didn’t already know the ending, you clicked the wrong link.) There were a few sobs in the theater, but mostly silence. The candy wrappers were still. Then Tom shouted, “Man, I could use some comic relief!” and we were deluged with popcorn. I grew up with Star Trek. My parents had a 10” black & white TV in their bedroom, and if I positioned the rabbit ears just right and put my foot on the cart, I could tune in the UHF station after school, when they showed re-runs of the original series (79 episodes, 1966-1969). Later, when I worked closing shifts at a movie theater, I’d turn to New York’s WPIX channel 11, whose after-midnight offerings included Star Trek (and Cheers). In elementary school I had a Spock doll, er, action figure. How could an awkward, lonely boy not love Spock? He was the ultimate outsider – not only alien to his shipmates, but alienated from his own people because he was mixed-species (Spock’s father was Vulcan, his mother was human.) He was devoted to logic and struggled with emotion; my perfect companion. 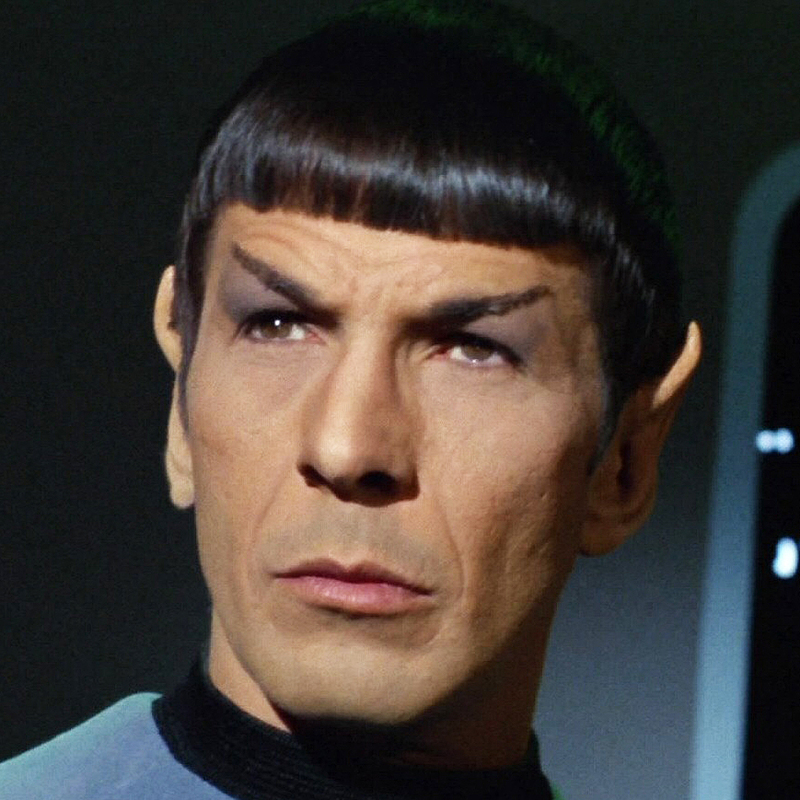 Leonard Nimoy’s single raised eyebrow remains with me today, and also the trademark scowl he didn’t seem to realize was intimidating, except maybe he did. The Vulcan salute, which Nimoy created based on a Jewish priestly blessing. Yes, Nimoy was also a painter, poet, playwright, and director. He famously wrote a book, I Am Not Spock (1975); his characterization resonated so much that he rightly feared being typecast. But how many actors have been lucky (or skilled) enough to create one of the most iconic characters in the history of visual media? Patrick O’Brian’s highly regarded literary character Dr. Stephen Maturin is based on Nimoy’s performance. And Nimoy did eventually make peace with it: his 1995 memoir was titled, I Am Spock. Spock observed humans with a keen eye, in all our folly, and chose to live and serve among us anyway. He was First Officer and best friend to Captain James T. Kirk and sacrificed his life to save the Federation Starship USS Enterprise (Constitution class, NCC-1701). And in the best Hollywood tradition, Spock was resurrected in the next film, which Leonard Nimoy directed. Spock: Ship… out of danger? Spock: Live long, and prosper. Posted in Memoirs, Movies, TV. Bookmark the permalink. In Praise of Teachers. All of Them.